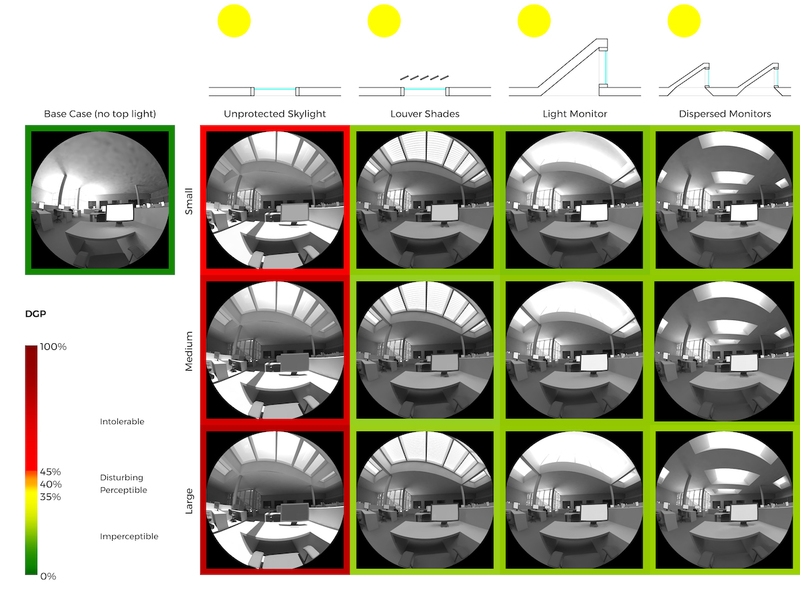 This glare matrix shows the results of computational design scripting, which allowed designers to simultaneously compare multiple types of toplighting for daylight, glare, and energy implications. There is a mountain of research to support the positive impacts of good daylighting, but there is less guidance on how to do it well. In this blog post and in a related webinar, we’ll look at how LEED v4 is changing that and touch on a new tool—computational design—that helps make the process of designing for daylight and quality views not only faster but also more successful. Since LEED v4 came out, there has been an increasing level of sophistication when it comes to understanding what makes for good daylight. Balancing the metrics of spatial daylight autonomy (sDA) and Annual Sunlight Exposure (ASE) has created an awareness that there is a sweet spot in design that maximizes daylight access while avoiding direct sun and the associated risks of visual discomfort (although the release of v4.1 effectively deemphasizes the glare requirements and encourages more projects to pursue increasing daylight in spaces, as measured by sDA). Similarly, the LEED v4 Quality Views credit pushes designers to think beyond providing a minimal line of sight to a window and to move toward improving angles of view and connecting occupants with visual access to natural elements. This daylight matrix is from the same study that produced the glare matrix above. Scripting produced the images, color coding the border around the image based on performance relative to the metrics. But for projects not pursuing LEED, or for those LEED projects that don’t have the time to do early-phase daylight modeling, the default process is to use rules of thumb and designer’s intuition for shaping the building and facades in order to bring in daylight. Without quantification, however, this approach can result in wishful thinking that ignores critical factors such as climate and site characteristics, façade orientation, or interior layout or materials. Fortunately for projects pursuing LEED v4, daylight modeling has become the standard for daylight design, providing an accurate assessment of the daylight performance of any conceivable design. Annual daylight simulation takes into account the climate-specific variability in sky conditions hourly and therefore the predicted amount of light available at any time throughout the year. The model incorporates the surrounding context so that the effects of adjacent buildings and trees on daylight levels can be properly accounted for. With modeling, the specific façade configuration can be reflected in the analysis, however unique it may be. The visual light transmittance of the glazing product used can be described, and optically complex materials such a translucent or fritted glass can be accurately modeled. Dynamic systems such as electrochromic glass or automated shading can also be incorporated into the simulation to understand how the operation of those systems in relationship to solar conditions and occupant preferences will affect overall daylight performance at every hour of the year. However, as with energy modeling, daylight simulation often takes place too slowly and too reactively, waiting for a fairly well defined design to be performed on and looking at a limited number of alternative configurations. This workflow requires a delay in proposing changes, testing those changes in the model, discussing and digesting those changes with the design team, and then iterating forward. This massing model analysis used scripting to take a series of simple massing models and convert them to a parametric daylight model where the window-to-wall ratio and glass could be varied. 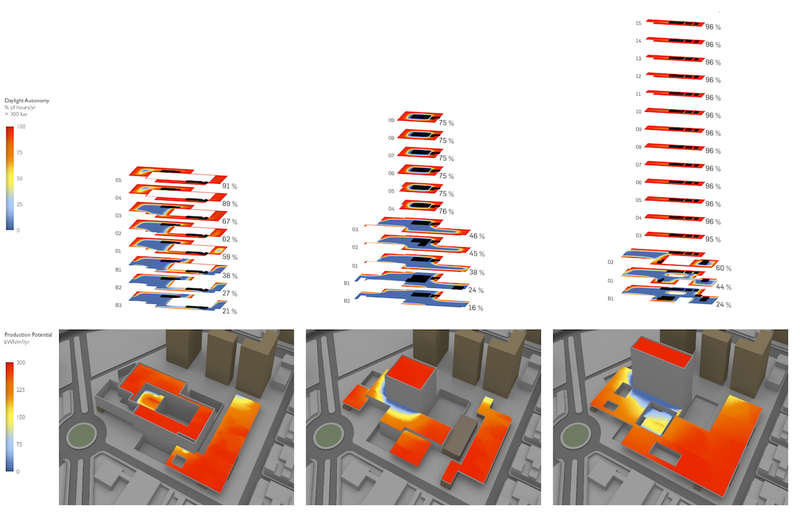 It was a way to look at daylighting potential early in the design process and iterate the massing quickly. The answer to this problem lies in the emerging field of computational design, where existing architectural tools like Rhino can utilize computer scripting to generate and flexibly update geometry. The open-source nature of the platform also lends itself to live connections to validated analytic engines such as Radiance. The combination of these two factors means that studies can be programmed to automatically run a vast spectrum of possible design scenarios that returns a quantitative foundation for design decision-making using the metrics of sDA, ASE, or any other that the team feels is appropriate. The fluidity of the model allows us to nimbly evaluate many more combinations of variables to help designers identify solutions that simultaneously meet their aesthetic, programmatic, and daylight objectives. Custom scripting in languages such as Grasshopper or Python can respond to project-specific design investigations starting at the earliest concept phase and continue through more detailed analysis in subsequent phases. Computer scripting can also help analyze and document the LEED Quality Views credit by evaluating vantage points for the four different view types in the credit much faster and with more precision than if done manually. This gives the design team the opportunity to evaluate and incorporate feedback from the analysis multiple times before their design is finalized. Computational design was used here to replicate complex geometry of the design for the daylight model and to automate analysis of more than 20 unique floors. 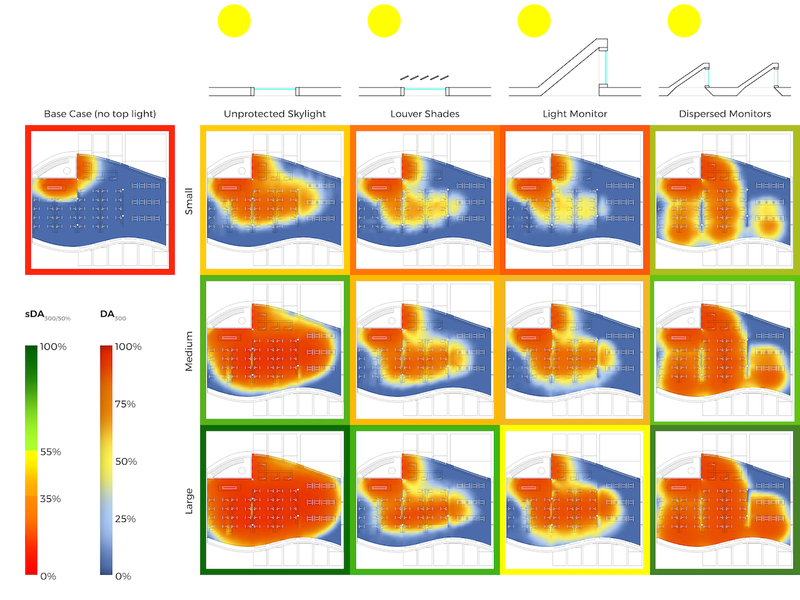 Overall, the computational design process provides significantly more timely and proactive feedback during the design process than the traditional daylight modeling methods while shifting the effort for the designers to tasks that will provide greater value, such as the analysis of multiple variables. Our webinar will focus on how computer scripting has been applied to projects to provide design exploration for daylight and views as well as facilitate document for LEED compliance. In addition, the same process can be used to evaluate building energy use and loads, which we will discuss in a follow-up blog post and as part two of the webinar series. Nice analysis, no ASE requirement in LEEDv4.1 Draft?! I am in agreement that ASE is a “proxy” for glare since it measures annual sunlight exposure at the workplane, not at eyesight. I am putting our company’s position on LEED 4.1Draft into a letter. In short I don't think this new version either serves the USGBC or LEED Users. Re: Nice analysis, no ASE requirement in LEEDv4.1 Draft?! I think we are in general agreement about being disappointed by the ASE change in 4.1 and the potential impact it may have on the quality of designs. Perhaps we can talk offline about potential ways of providing that feedback to the USGBC. ASE is more a proxy for glare than a glare metric itself. Direct light hitting a horizontal work surface would be a possible indicator of glare potential, but visual discomfort is a function of so many other factors such as individual preference, age, direction of view, contrast ratios in the vertical plane, etc, etc. Glare metrics such as DGP capture more of these factors, but have their own limitations such as being view and time dependent as well as computationally more intensive to calculate, whereas (to its credit) ASE has the benefits of providing an annual perspective, being view independent, and is pretty simple computationally. So often we need to study a variety of different metrics to get the best picture of the performance as the design progresses. 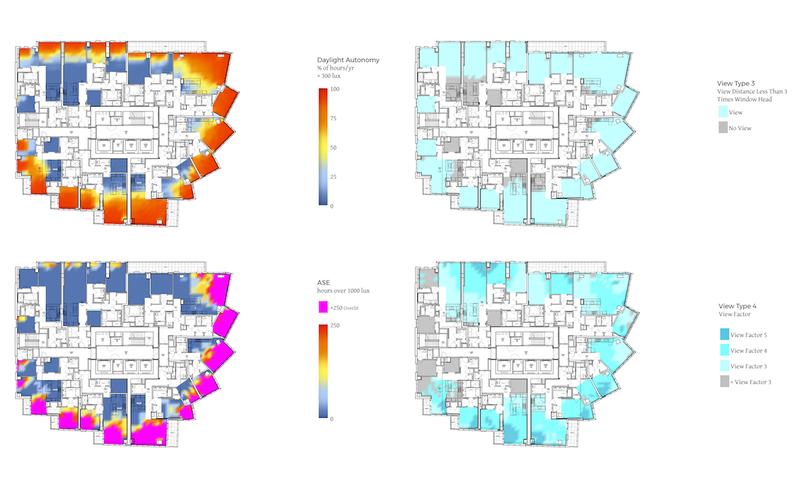 Additionally, ASE makes sense for some typologies such as office spaces, but perhaps less so for others (such as residential) which may have different occupancy patterns and characteristics (such as flexibility to adjust one's position). The CI that exempted spaces less than 250 sf seemed to recognize that since most residential spaces are more likely under that threshold, which is why I would have preferred modifications to the LEED ASE requirements like that rather than a complete downplay of them. Thanks for your response and clarifications. Per your own analysis, the skylight narrative of finding a better design is not supported by the LEED 4.1Draft rubric. Without seeing individual data points, unprotected glass versus disperse monitors basically receive similar sDA scores (I postulate placement is the greatest variance). I am curious why you said "ASE was not a perfect metric and was hard to comply with even after the CI which raised it to 20". I agree there is NO perfect metric for daylight, but there is data from this study illustrating when ASE>20% occupants are much less satisfied. Are you/the USGBC able to illustrate well daylit buildings with ASE>20% that did not pass (and were not exempted in LEED4.0 like small spaces and spaces that use automated blinds or glazing) to make such a radical change? I think providing these case studies would be an important contribution to the science. With no ASE controls-- I ran a set of simple glass box studies illustrating from Florida to Alaska they all receive 100% sDA scores with the blinds operating (you still hit 300lux with so much glass/shade diffusing light + getting light from windows pointing away from sun). I agree with you that there can be some tuning using the blinds as a reference, but with 100% sDA/max LEED4.1 points, why bother with "success" (yes sarcasm here :)? I agree with your point about blinds and view-- its a driver of well designed daylit spaces. I agree that LEED v4 was a revolution, but LEED 4.1Draft has hijacked it. I think its okay to make a standard more accessible, but not outright greenwash it. I have written the USGBC about the issues with ASE and several other imperfections with 4.1Draft, without a response. Can you suggest the right forum on LEED User or elsewhere to talk about this and provide educational materials? Ideally this would be with decision-makers of the USGBC. Thanks. The boundary colors in the images indicate the performance for each metric. In the case of the second set, it is indeed the sDA % of floor area above 50% DA. The computational design script was set up to automatically color code the boundary based on the performance of the option as it created the matrix of options to give a quick visual reference as to the relative performance. I share your concern that the de-emphasis of ASE in LEED 4.1 will lead designers towards more glass boxes to maximize illuminance levels, which is not good for visual comfort (or energy performance for that matter). The requirement to balance sDA and ASE led to more thoughtful consideration of how to design the facade to get more quality, balanced daylight as opposed to just quantity. ASE was not a perfect metric and was hard to comply with even after the CI which raised it to 20%. But I would have wanted to see LEED modify the requirements to address the concerns rather than mostly dispense with it. Perhaps by allowing the first 5 feet from the facade to be excluded from the ASE total or something along those lines. The one saving grace is that the sDA metric in LM-83 makes you take into account the impact of occupants closing blinds in response to direct sun. So hopefully the blinds being down often in "glass box" designs will appropriately penalize the sDA for those schemes and they will score lower against design solutions where daylight is being appropriately managed. It would also be great to tie this to the views credit somehow... if the blinds are down so often, it degrades the quality of the views! Nice work providing performance metrics going from an unprotected (glass?) skylight to dispersed monitors. Is sDA the boundary color for the second set of images? As you mentioned in your article LEED4.1 draft does not score ASE anymore, so the unprotected glass skylight will score similarly as the dispersed monitors. In fact in LEED 4.1. draft glass boxes that have glare and whose blinds may be closed most of the year will get max credits, similar to a well thought out passive daylight system. The 2017 CI of moving ASE from 10%-20% accurately reflected the IES intention with LM-83. Do you agree with the USGBC that glass boxes (or in your example a glass roof) should score the same (or higher!) as a well thought out design like the one you created?